I am in love with student writing. I never cease to be amazed at what kids can do with a little bit of instruction and a little bit of time. My son is a classic hard case second grade boy. He never has anything to write about; it’s like pulling teeth for his poor teacher. She’s generated lists with him. She’s had us work on an expert list at home. Every generating trick known to teacher-kind, she’s tried it. It seems that we have turned the corner. This past week while we were in his parent teacher conference, he sat and wrote a “book”. It’s “4 chapters”. Of course before he could write, he had to construct a fort in the corner of my office made of a pad of chart paper and a computer printer box roof. He then found “special” paper to be his writer’s notebook. He said he wanted to write a fiction book. I, of course being me, suggested he take a real-life problem and turn it into a story (classic UOS Calkins’ generating technique). Take for instance, his desire to have a lizard. I suggested he write a story about a boy who wants a lizard and the things he does to get his parents to get him a lizard. “Mom, that can’t be a fiction story because that’s really going to happen. I’m going to get a lizard.” (Poor delusional boy-No truly means no). Instead he decides to write about “his” lizard. He calls the “paragraphs” chapters and makes a cover page, staples it together, and is ready to read it to all who will listen. My favorite part is the about the author at the end. Right before we had left for parent-teacher conferences, I’d been reading parts of the NCTE annual convention program aloud and exclaiming in excitement for different parts of it. At the end there are Both kids had been peering over my shoulder to see what authors were going to be there and if they recognized any of the book titles. Jeff Kinney of Wimpy Kid fame will be there and his “About the Author” was the inspiration for my son’s about the author. Mentor texts in a whole new light! I had not thought to have kids use the “About the Author” for inspiration for writing theirs. We’ll have to give it a try! Here’s a great link from the Stenhouse newsletter and blog. What a great opportunity to submit your boy writers and get feedback from a master! Here’s a chance for your students to get feedback on their writing from Ralph Fletcher, author of Boy Writers and the DVD “Dude, Listen to This!”. We are calling for samples of quintessential boy writing; Ralph will select and comment on a handful of submissions. And we’ve set up a group on Ning for teachers to view and discuss the writing samples, Ralph’s comments, and other boy writing topics. Glacier Ridge Elementary is a beautiful school. I’ve had the opportunity to attend a professional workshop last spring and this fall in the building and both times I’ve been very impressed by the displays of literacy throughout the school. The dedication to reading and writing is evident everywhere. This is not Kelly Gallagher’s finest photo but I had to include it. 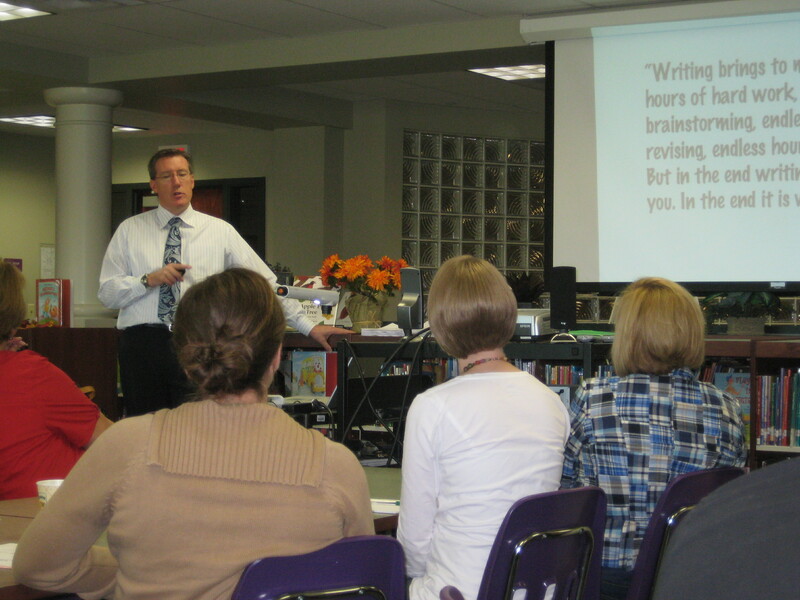 Once again the Literacy Connection of Columbus has offered a wonderful opportunity to teachers in Central Ohio. For $50 I was able to attend a presentation by Kelly Gallagher on Saturday from 8:30-2:30. He really touched on all of us books, but started with a keynote on Teaching Adolescent Writers. I took copious notes and was once again impressed with him-as a teacher, a presenter, and someone who is passionate and dedicated to literacy. He is a practicing teacher in Anaheim, California. I am planning on adding to this post with highlights from the notes I took as time allows this week.